Bull reds hang out in the slough between Hunting Island State Park’s beach and a big sandbar that runs just offshore. This time of year, many anglers have winterized their boats and stowed their gear, but they are missing out on some great fishing. 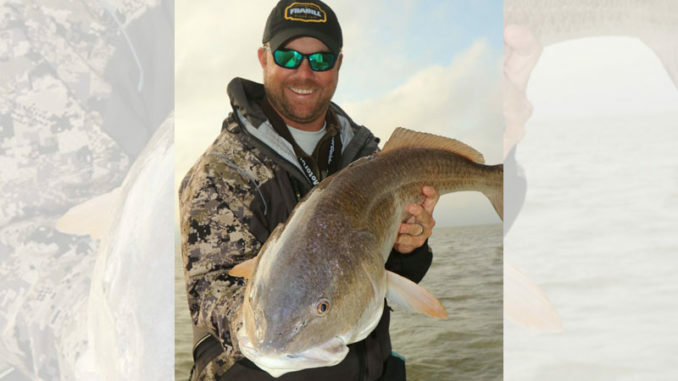 Redfish in South Carolina’s Lowcountry are especially active and eager to feed this month, and it’s a great time to catch your personal best, as well as some slot-sized fish for the frying pan. Zane Iverness of Honea Path, S.C., spends this entire month camping at Hunting Island State Park, and he fishes almost every day. 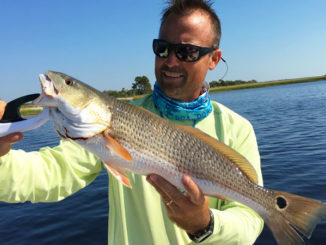 Aside from keeping himself fed with keeper redfish, he enjoys targeting bull reds in two main areas: Johnson Creek, and just in front of the state park’s beach, within sight of Fripp Island. “I make two trips from Honea Path at the beginning of the month. I pull my camper, then I go back home to get my boat and bring it down. It’s just a john boat; that’s all you need to have plenty of good fishing,” he said. Iverness starts most mornings casting lipless crankbaits in Johnson Creek, and even though he gets mixed results from one day to the next, he catches enough to keep his interest up. His favorites baits are 1/2-ounce saltwater-rated Rat-L-Traps in Electric Chicken and chrome/blue back. “I like it best on the high end of the rising tide, and I’ll fish on through the full high tide,” Iverness said. “I mainly stay close to where Johnson Creek opens up to the ocean and on into the creek until the (US) 21 bridge. I’ll catch a lot of them in what you would consider no-man’s land, just along the bare banks where it doesn’t look like much is going on. “I drop anchor about 6 feet off the bank, then cast parallel to the bank. I just cast and reel pretty steady. If they’re there and hungry, they’ll smash it,” he said. For afternoon and evening fishing, Iverness heads to his other spot. “Just off the tip of Hunting Island and right across from Fripp, there’s a big sandbar. It extends way down the state park’s beach. 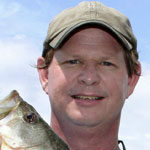 You can catch a lot of redfish in the area between the sandbar and the beach,” he said. “This is where I mainly catch bulls. I’ve caught 48- and a 49-inch fish on back-to-back casts here in the winter using 6-inch Gulp grubs in new penny (color) on jigheads in the 1/4-ounce to 1/2-ounce range,” he said. Iverness uses a fairly slow retrieve with occasional pops of his rod tip. “It’s my favorite time of year to fish, without a doubt. You’ve got fewer people and boats to deal with, you have some really nice 60-plus degree days, and even the cooler days are rarely all that cold. I don’t know why more people don’t fish this time of year. I think the fish bite better now too,” he said.